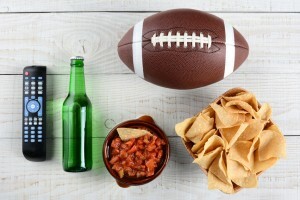 Super Bowl Sunday Party Ideas on a Budget! As the Denver Broncos and the Carolina Panthers gear up to face each other for the second year in a row many fans are planning and preparing for the big Super Bowl party. No matter if you love the Broncos or the Panthers you’re bound to love the gathering of friends around tasty food to watch the big game. Heck, maybe you’re there for the commercials or to watch Coldplay in the halftime show. No matter what your reason is, hosting your Super Bowl party could be expensive but doesn’t mean you need to stress you out. Here are some party ideas that everyone will love and won’t make you go broke and feel deflated (haha). It’s usually everyone’s excuse to put their New Year’s resolutions on hold and indulge in the cheesy, fried goodness that you find at most any sporting event viewing. To save on cash but still prepare some awesome game time munchies you should check out your pantry and your freezer – even look way in the back. Might as well take out the 409 and get some cleaning done while you’re at it, right? You never know what yummy dishes you can uncover when you take stock of what you currently have. Maybe you’ll find some frozen meatballs and some sauces in your pantry, add that to one crockpot and there is one whole dish and you’ve never even stepped foot in your local Albertsons. The other great way to save on food purchasing for any party is to tell guests it’s “potluck.” This is always a big hit because typically people bring the dish they are best at so it always tastes great. Plus, you, as the host, are only on the hook for preparing one dish and don’t have to spend tons of money on appetizers or all weekend preparing food. It’s really a win all around! Just make sure to find a power strip before the party as you’re likely to be hosting a few crockpots. Don’t think that you have to go all out on the décor for this one party, but if you do want your home to look festive you have many inexpensive options. If you’re having a family friendly party, set up a craft table with paper and markers (team colors only) and have the kids make the decorations. Not only will this give the kiddos something to do but they will be proud to display their art, and you’re new décor, for the big party. Streamers are another inexpensive option – one idea may be to split your living room in half, using the team colors. One side roots for the Panthers and the other for the Broncos. This makes your living room look festive as well as makes your party a little more fun and competitive. Of course, everyone is there to watch the game (and the commercials and the half-time show) so don’t feel like you need to prepare any sort of extra entertainment. However, if you feel this is a must for your party this is definitely an area where you could get creative without breaking the bank. You could grab some face paint in the team’s colors and make your guests predict the winner by wearing that color. Or you could easily find some great football trivia on the internet and play a game with your guests where the winner who knows the most wins a prize. Usually, you can find some great items for any party at your local dollar store. Check here for paper goods like plates, napkins and cups. Chances are you’ll be pleased to find your decorations here too. If you do plan to play any sort of game to entertain your guests you could also grab some candy for a goody bag there while you’re at it. If it’s a true dollar store you’ll be able to grab the things on your list for under $10! If you’re already too far into the party planning and your budget has gone haywire, don’t freak out. All you need to do is contact Tio Rico Te Ayuda for New Mexico title loans that will give you the cash that you need fast. Our staff will help you through the quick and painless process from start to finish, to get you the money you need to throw an awesome and memorable Super Bowl party. Don’t hesitate to ask us questions or contact us for more information.